Cinnamon and sometimes chocolate – yes these are part of the delectable ingredients that make Cincinnati Chili so addictive! A soup-like consistency – it’s actually a Mediterranean-spiced meat sauce that was developed by Greek-Macedonian immigrant restaurateurs in the 1920s. 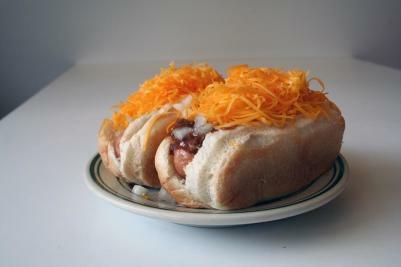 Spaghetti and/or hot dogs – because of bullet point #2, this “meat sauce” is used as more of a topping. 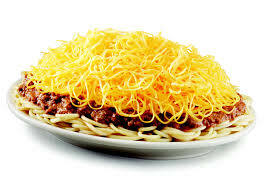 Much like goetta, immigrants were trying to make their food “go longer”, so using the chili as a topper to spaghetti (see below options) or hot dogs (called &apos;coneys&apos;) did just that! When it comes to taste-testing Cincinnati Chili, there is no shortage of parlors on both sides of the river: Camp Washington, Covington, Dixie, Gold Star, Skyline, etc. (Yes, I listed these in alphabetical order so as not to offend anyone). Even more options can be found here. Since today is National Chili Day, I encourage you to experiment on your own. You’ll have a lot of fun doing so, and you may discover a new local favorite!